From the beginning, Yamasho Inc. has focused on its long term relationships with customers which enables them to anticipate their customer's needs and to meet and exceed their expectations. With the explosion in popularity of Japanese food and culture in America over the last quarter of a century, Yamasho's goal is to create a new generation of food service while adhering to traditional methods.We provide a wide variety of restaurant items ranging from tableware, kitchen equipment, knives, sushi cases, decorations and many other items that are needed for running a successful restaurant business.Our dry, chilled and frozen products are all in accordance with the FDA's Hazardous Analysis and Critical Control Point (HACCP) standards and are delivered in a timely manner. 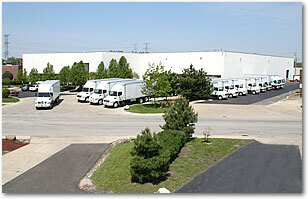 We own and operate a fleet of local, as well as over-the-road trucks designed especially for food delivery. Yamasho is currently applying for CMBDC (Chicago Minority Business Development Council) membership.